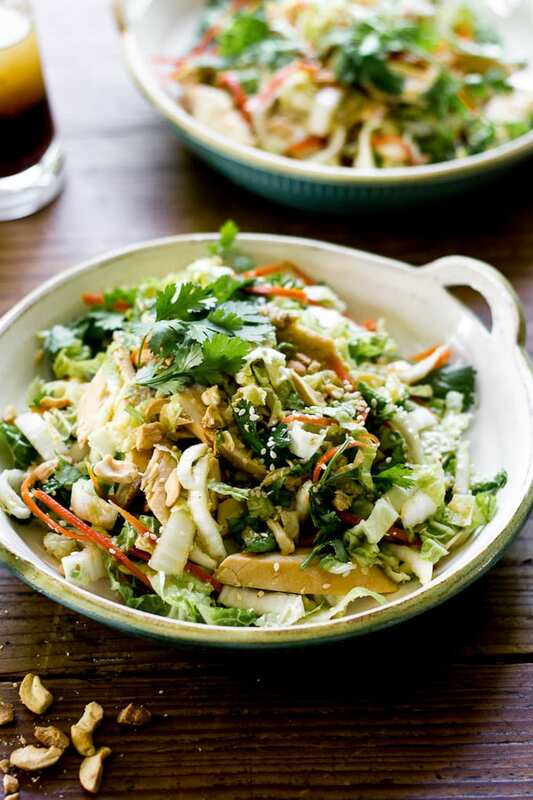 I’ll give you $100 bucks if you can name 3 cabbage recipes off the top of your head… Go. And it can’t be coleslaw. Can’t do it? Me neither. Cabbage stumps me every time. I’m not a cabbage hater, but I literally can’t think of anything to make besides coleslaw. Why is that? What’s worse is that when you finally commit to something, you never actually use the whole thing because cabbage is GIANT which means leftovers for days, AND if you haven’t gotten the memo, cabbage is immortal. It. Never. Goes. Bad. There is one other thing that I can make besides coleslaw, and it’s this salad. Shreds of green cabbage, poached chicken, and crunchy ramen noodles? Yes, that one. I’m sure you’ve tried something like this before in your lifetime. I’m re-vamping the original with a convenient store-bought rotisserie chicken, and a homemade soy-ginger vinaigrette that will make you want to lick the bowl. This recipe is quick and easy to put together, and you can vary the ingredients as you wish. But I have one rule; slice everything paper thin. The vinaigrette will soften the vegetables so that you can easily twirl them around (pasta style), instead of struggling like a ravenous goat chewing on a pile of ruffage. Too chunky is too funky. Since posting this recipe, I’ve made it 3 different times to tackle the inevitable leftovers (I own you!) Adding thinly sliced flank steak from a BBQ or chickpeas for a vegetarian version both turned out to be really good. I’m loving this for a light and refreshing summer salad. It’s quite filling, too. PS- you will have extra vinaigrette leftover, so feel free to use it as a marinade for grilled vegetables, such as eggplant and zucchini, or drizzled over tuna steaks and shrimp. You’ll want to drink it! 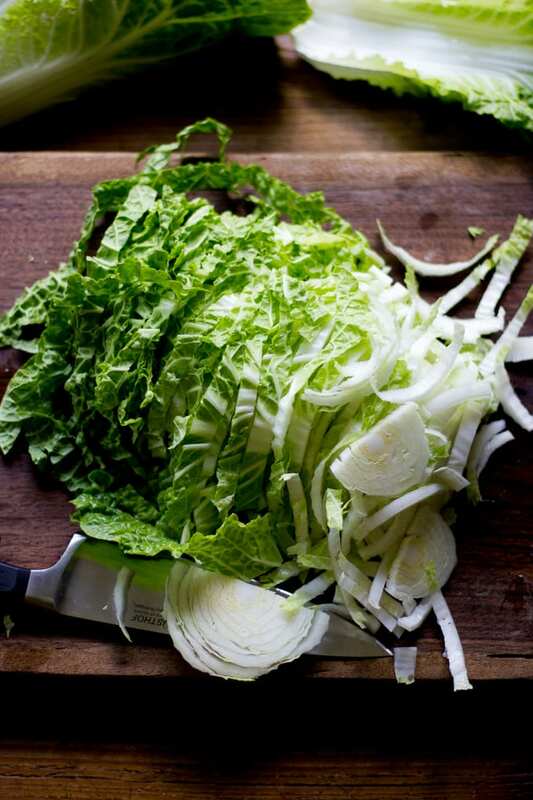 I like to use Napa cabbage for its paper thin texture and super crunch. Use a mandolin to thinly slice/julienne your vegetables, or do it by hand. * Use a mandolin to thinly slice/julienne your vegetables, or do it by hand. In a small skillet, add the cashews and toast gently over low heat. Transfer to a cutting board to cool. Chop into bite-sized pieces and set aside for garnish. 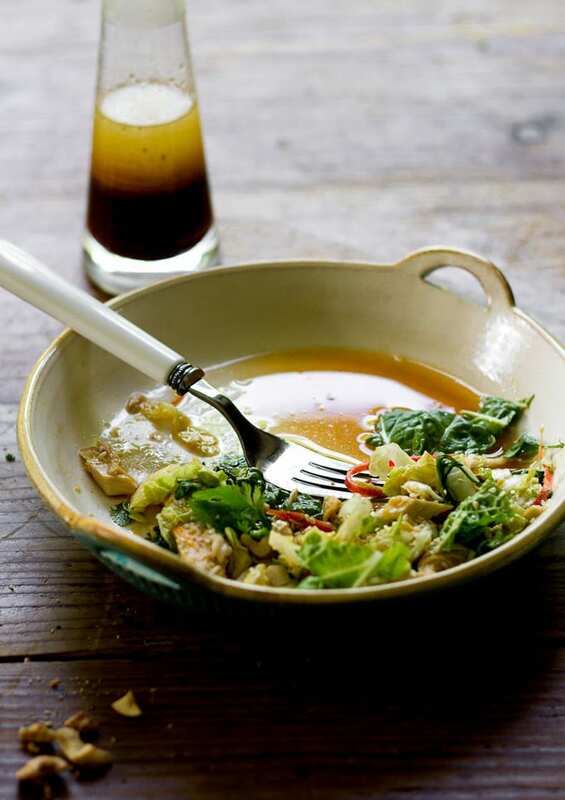 To make the vinaigrette, add the first 7 ingredients to a bowl and whisk well to combine. Slowly add the the olive oil and continue whisking to emulsify. Remove both breasts from the chicken and thinly slice (or shred with your hands). Save the rest of the chicken for another use. 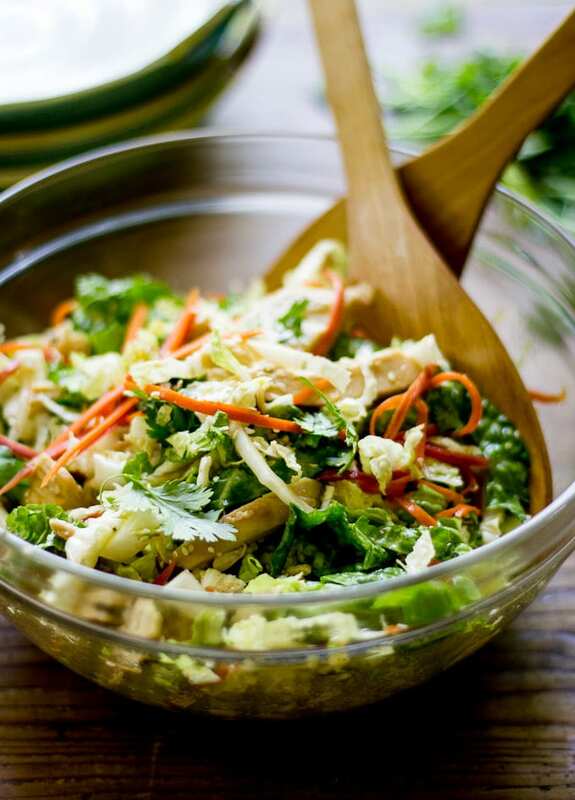 To a large bowl, add the cabbage, carrots, cilantro and chicken. Add a small amount of vinaigrette and toss well. 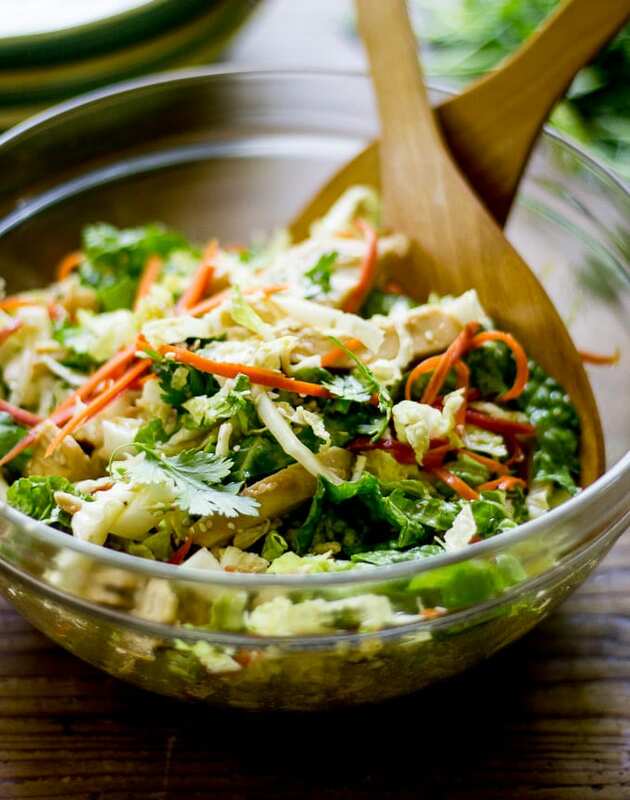 Taste the salad, and add more vinaigrette if desired. 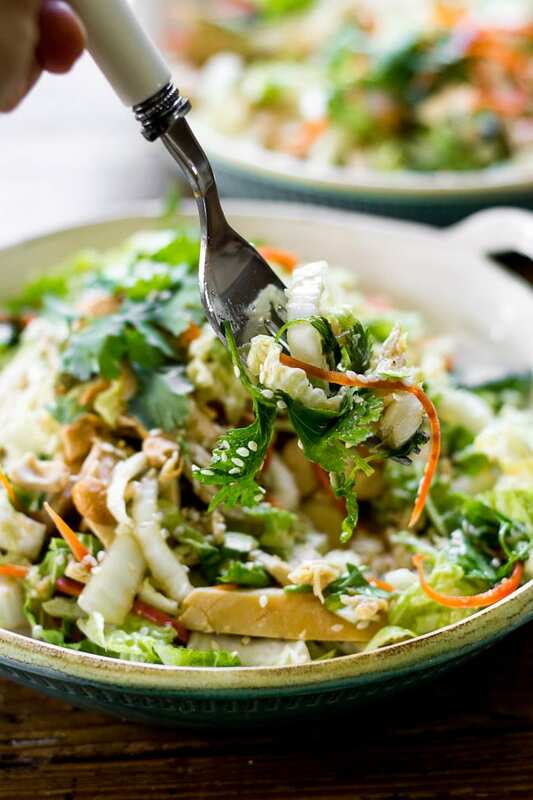 Garnish with chopped cashews and sesame seeds. 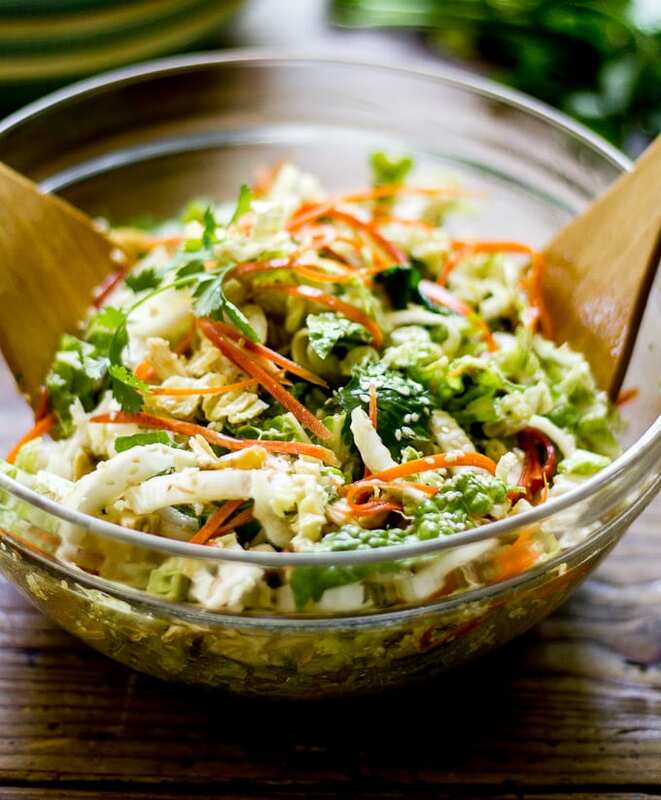 I love raw cabbage salads (really! ), one of my faves is red cabbage with a mustard vinaigrette. This sounds simply fabulous. This post made me laugh. You manage to capture what so many have thought but never realized about this vegetable. I love how colorful it looks and I can just smell the ginger dressing. Can’t wait to try it! I am so happy I stumbled across your blog. So many great ideas! Wonderful! Cabbage is so tasty, isn’t it? Making this as we ‘speak’……I assume its 1/4 CUP of red wine vinegar??? We will see, cuz that’s what I did….sound lovely! Hi Leigh! You are correct ;) Thank you so much for catching that! I’ve updated the amount.